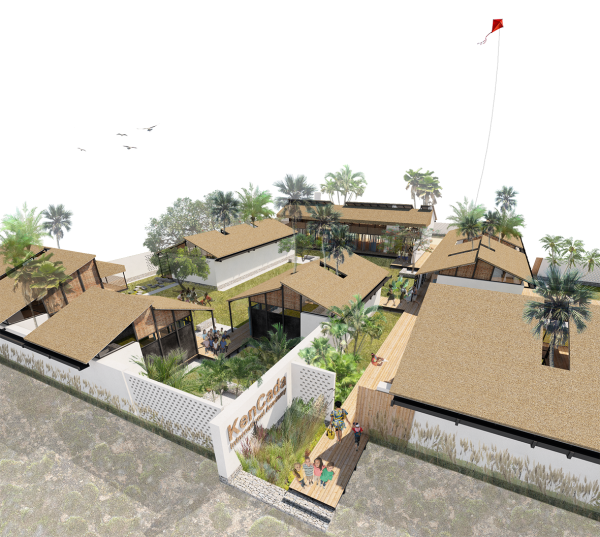 Tropical Courtyards reinterprets the Swahili patios to develop learning spaces while answering to climate constraints. Architecture is conceived as added educator where the courts become means of modularity and flexibility to promote cross-pedagogical activities. The design is characterized by the dichotomy of the massive coral stone walls, oriented to protect from the south-east wind and rain, and the light modular elements anchored to them opening to the north-east dry breeze. The stone walls act as a supportive spine of the modules, which can be compacted, raised, or built in phases according to future expansion and funds availability. They also offer in-built furniture both inside the modules, and in the courtyards. By means of architectural elements there is a promotion of active learning, creativity and innovation through the variety of experiences. The design incorporates enhanced thermal comfort, versatility, children-sized proportions, and safety considerations. Learning areas, offices, and services are studied to stimulate the children and support the teachers in arranging different activities and creating a collaborative working environment. ​Since the instructor is not considered the sole source of knowledge, both interiors and exteriors generate flexible play-based learning areas offering the children the possibility to explore and discover the building while subconsciously develop a sense of independence. 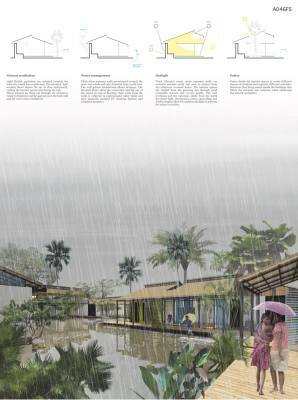 The flexibility also rests on the response to the climate: the school not only rises above the ground to be waterproof, but actually transforms the flooding experience into an opportunity to use the space alternatively. 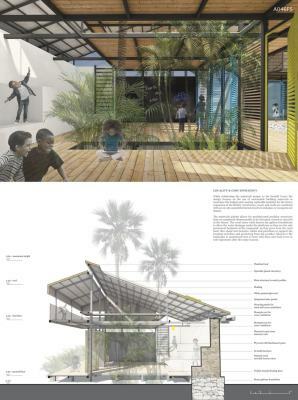 The school is transformed in a floating platform allowing the landscape to self-regenerate. Cooling passive ventilation and access to natural light are the driven factors that informed orientation, patios arrangement, walls placement, and permeability of the modular surfaces. 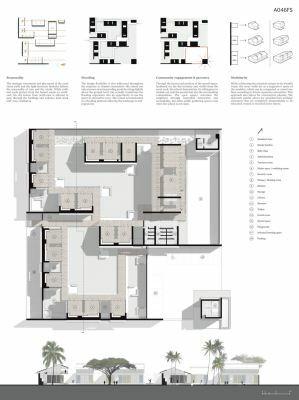 Both cross and stack ventilation are enhanced by the materiality of walls and roofs, while the sunlight can be controlled by movable louvers, porches and balconies. These are a reinterpretation of the traditional Swahili balconies, intended as strong architectural element to characterize the facades of the two story buildings. 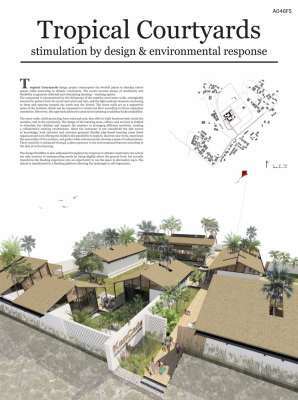 While celebrating the materials unique to the Swahili Coast, the design adopts sustainable technologies to maximize the budget and create replicable modules. Coral stone, wood, and reeds are combined with an on-site assembled metal structure and screens. The materials palette allows for prefabricated modular structures that are completely dismountable to be relocated, reused or recycled in the future. The coral stone walls feature dry gabion foundations to allow the water drainage under the platforms and they are the sole permanent footprint of the compound. As they grow from the coral land, they shape into benches, tables and partitions to support the learning activities and protect from the weather. Moreover the landscape is maintained free to host wild flora and local trees to self-regenerate after each rainy seasons.